A few days before his election to the AFRINIC Board, Seun Ojedeji, one of the longest serving Policy Development Working Group (PDWG) Co-Chair, talked to us about Internet Governance and Policy development in Africa. Seun has always been passionate about discussing Internet developmental issues and this was evident as he spoke with us about his involvement with policy development. ‘’Before getting to grips with policy development, I was involved with AfNOG and on the Nigeria NOG mailing list," says Seun. "The openness and bottom-up process were what attracted me to sign up to AFRINIC's Resource Policy Discussion (rpd) mailing list and soon it became part of me. While it may look complex at first, as long you can read and write, you will be able to understand the process. So long you have the initiative to think and contribute, your voice will be heard." Back in the days when the Internet was just emerging in Africa, Seun nurtured a passion for the Internet. "In 1999, Internet penetration was not high," he continues. "I would go to a café to send a mail to someone and was fascinated by the fact that someone was able to receive it. I got interested in computer sciences, networking and later got into jobs that were network-related. I started learning about network management, topology planning and more. The current Chair of the AFRINIC Board, Sunday Folayan, one of the first people to bring the Internet to Nigeria, was one of my early model and mentor, often remotely. The second was Architect Iyke Ifeanacho, the former ICT Coordinator at the University of Nigeria, Nsukka (Enugu Campus) and first ICT Director of Federal University Oye-Ekiti who unfortunately met with a tragic car accident. He had a deep influence in shaping me and was someone I was relying on to progress in the industry. It was one of the most challenging experiences in my life but this was a push for me to become more independent." The Cross Community Working Group (CWG) on Naming Related Functions, which was in charge of developing a proposal for the Names community. The Consolidated RIR IANA Stewardship Proposal (CRISP) Team, which developed the Numbers community proposal. The IETF's ianaplan Working Group, which developed the Protocol Parameters proposal. The Cross Community Working Group on Enhancing ICANN Accountability (CCWG-Accountability), which worked on enhancing ICANN's accountability once oversight was transitioned from the US Government to the multistakeholder community. However participation in Internet Governance from the African region is still comparatively low, and through his involvement, Seun expects that people from Africa who are reluctant can see him as an example and will want to follow in his steps. "People from our region tend to be scared or too shy to post on public, global lists," he explains. "We need to pull people out of their comfort zone. We can achieve this by encouraging local participation. For example, during the IANA stewardship transition proposal development process, we created a local mailing list and whatsapp group in Nigeria which was championed by Mrs Mary Uduma and supported by NIRA to discuss Internet Governance, specifically in relation to the ICANN ecosystem and the response so far has been good. Nigeria also has a National IGF that serves as a platform to gather local views on global issues and where some people feel more comfortable to share ideas. People should also get in touch with their local IGF and, if there isn't one already, they should consider creating one." Even though participation and visibility for Africa has improved a lot during recent years, the rate at which the Internet is developing in Africa is not proportional to level of awareness and education in relation to Internet Governance. Seun feels very strongly that we, as a community, need to act on this. Seun’s advice to young network engineers is to think outside the box because of the speed at which Internet is evolving. "My advice is also to grab the opportunity with both hands when the time comes," he adds. "Young people should always be at the stage of learning, asking questions, being curious and constructive. Never stop learning. " 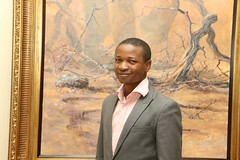 Seun Ojedeji currently sits on the AFRINIC Board of Directors and is based in Nigeria. He was heavily involved in the IANA Oversight Transition discussions and proposal developments. He has been a valued member of the AFRINIC community for several years. Find out more about the AFRINIC Community and how you can get involved. You do not need to be an AFRINIC member to take part. Get informed: read the current AFRINIC policies and policy proposals and have your say. Attend the next AFRINIC meeting, AFRINIC-25, to discuss policy, network with other IT professionals and Internet governance experts, and attend world class training sessions.